For more information, contact S.Y. Chen, director of Illinois Tech's Master of Health Physics program. Master of Health Physics students and alumni attend 2017 Health Physics Society Meeting in Raleigh, NC. From left to right: Patrick Haan, S.Y. Chen (program director), Erin Evans, John Edwards. Trenton Yadro, S.Y. Chen, and Jon Haas at the 2017 Health Physics Society Meeting in Raleigh, NC. Ian Hoppie, S.Y. Chen, and John Edwards at the 2017 Health Physics Society Meeting in Raleigh, NC. S.Y. Chen, Erin Evans, and Brenda Tubbs at the 2017 Health Physics Society in Raleigh, NC. 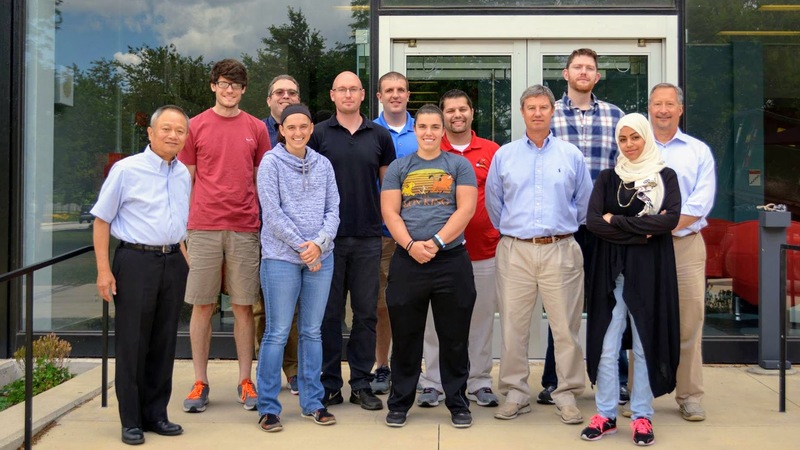 In June, students in the online Master of Health Physics program gathered on campus for their Instrumentation for Radiation Health Physics lab class. 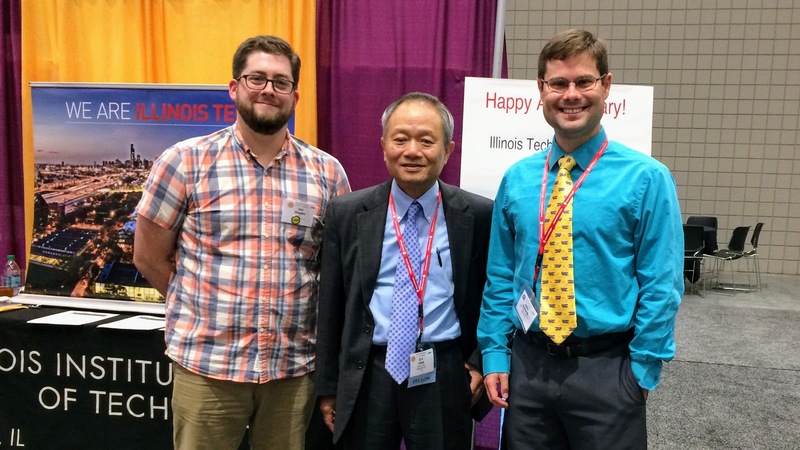 On May 6, 2017, the Midwest Chapter of the Health Physics Society held its 2017 Annual Technical Symposium on Illinois Tech’s Rice Campus in Wheaton, IL. 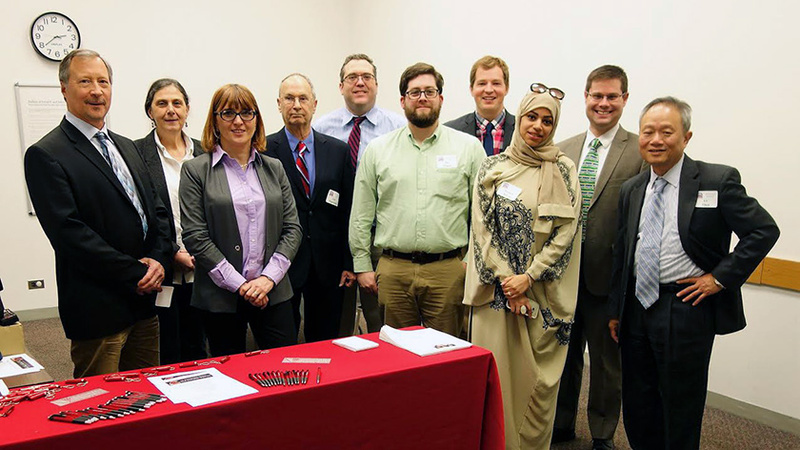 [from left] Steve Butala, Tatjana Pannesku, Mirela Kirr, Carl Paperiello, Will Limestall, Ian Hoppie, Ian Lake, Khlud Alsiraj, John Edwards, S.Y. Chen. 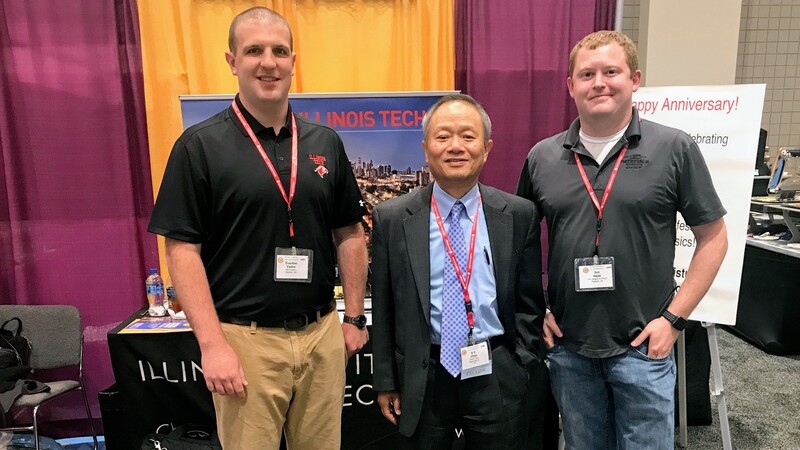 Illinois Tech offers students opportunities to become involved in the profession, through its Student Chapter of the Health Physics Society, the local Midwest Chapter of the Health Physics Society, and the Oakridge Associated Universities (ORAU). Health physicists’ benefits include highly competitive salaries (2016 HPS Salary Survey) and a professionally rewarding career. Hear what our students have to say in our Rad Hawks Talks series. To earn the master’s degree, students must satisfactorily complete a minimum of 31 credit hours, maintain a minimum grade point average (GPA) of 3.0, and pass a final comprehensive exam. For more information see our FAQ. If you are an undergraduate student, you can apply for our co-terminal bachelor of science/master's degree program (B.S./M.A.S.) where you can complete a Bachelor of Science in Physics and a Master of Health Physics degree in just five years. If your career goals do not require a full master's degree, you can earn a Certificate in Radiological Physics by taking just 12 credit hours of health physics courses. If you are already a Board Certified Health Physicist, you can hone your skills by earning your master's degree or by taking individual courses for AAHP continuing educations credits (see below). To be considered for admission, applicants must have completed coursework in calculus through differential equations and a calculus-based general physics sequence. A course in modern physics, including some basic quantum mechanics, is strongly recommended. Students are required to hold a bachelor's degree in physical or biological sciences with a GPA of at least 3.0/4.0 from an accredited institution of higher education. All applicants must submit their transcripts, two letters of recommendation, an application fee, and a professional statement. The Graduate Record Examination (GRE) is required for all international students, domestic students with an undergraduate GPA between 2.5 and 3.0, or at the request of the admissions committee. The recommended minimum score for admissions consideration is 304 [quantitative + verbal] and 2.5 analytical writing. Illinois Tech will be at the 63rd Health Physics Society Annual Meeting in Cleveland, OH from July 15-19. Planning to attend? Make sure to stop by exhibit booth 421 to say hello. 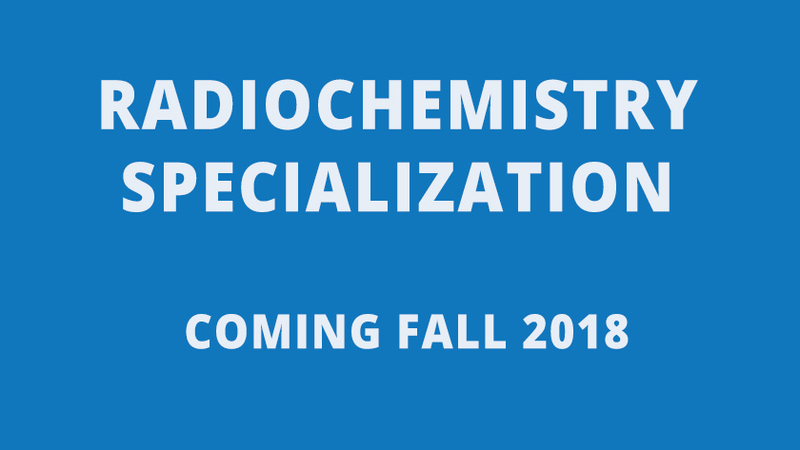 Also, join us on Monday, July 16, at 6:30pm to celebrate the launch of our new radiochemistry track. 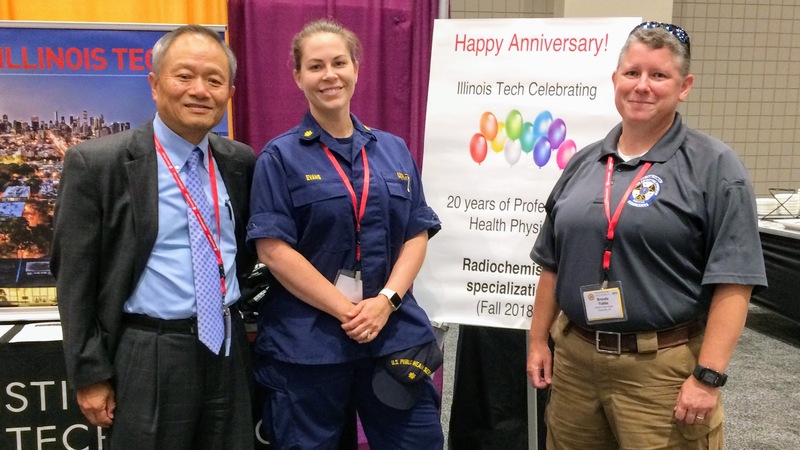 Illinois Tech’s own professional master's health physics program, a program in the Department of Physics which endeavors to train the future health physicists of the world, just so happens to be celebrating its 20th anniversary this year, and is doing so with pride. 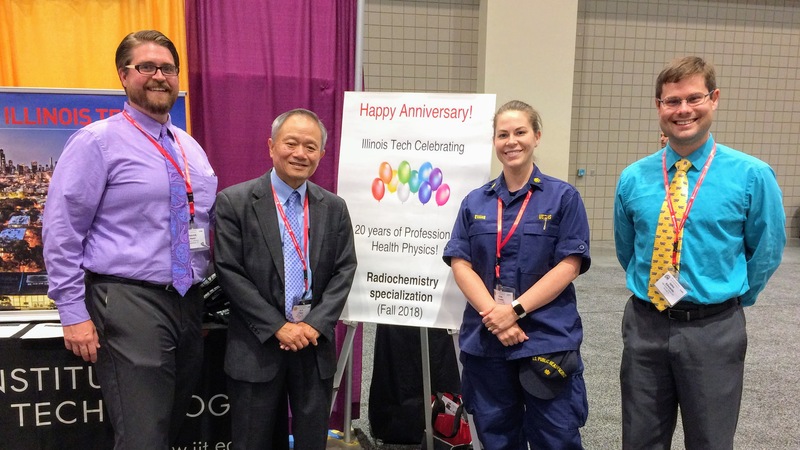 The Health Physics Society at Illinois Tech has been established for graduate and undergraduate students at the school to network with classmates and professionals, share ideas, and explore careers.